The ferry ride started out wonderfully. We got all of our things loaded with the help of Logo, his wife and youngest kid (Samantha just mentioned that Biu, the youngest kid, was a girl, not a boy...oops!). We boarded and hung around waiting for the ferry to depart. We chatted with an American Peace Corps volunteer named Luigi who's been living in the south of Koro for about a year. We met a nice Fijian lady named Moti who lives in Nadi, and was heading back to her home village of Nabuna, just south of our village called Waisali. It was magical watching the sun go down over the Koro Sea, and Samantha pointed out over the water and said, “now a dolphin will jump out of the water.” ...and just like magic one did before she even finished her sentence. For about 5-10 minutes a small pod of them chased the ferry, jumping and flipping. Then, many of us started feeling the effects of motion sickness. Once again ginger root to the rescue! Samantha and I don't typically get motion sickness, but we both started feeling sick to our stomachs. Luckily, we had decided to get a kilo at Suva market, so we were chewing on slices pretty much the whole night. I gave some chunks to Luigi and Moti and they were grateful. I'm amazed that through a 12 hour trip, I never had to use the restroom once -and really happy considering the state Samantha said it was in when she tried and failed to bring herself to use it. 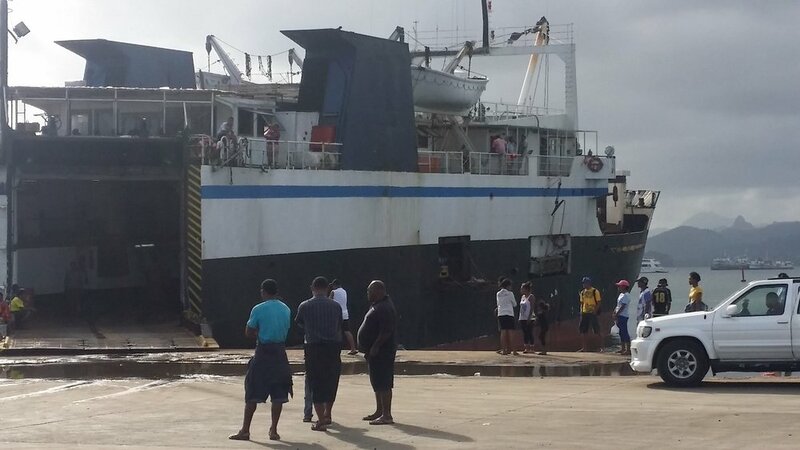 It turns out that the ferry was delayed because it had gone out to one of the most remote islands in Fiji and it was packed with people for several days in a row, and they must not have had time to clean anything. But, after a long, long ride we made it to Koro as the sun came up!